US economy is showing signs of strengthening while the Euro-zones are still grappling with the worsening sovereign debt crisis following Moody's latest downgrade on Ireland's foreign- and local-currency government bond ratings by five notches to Baa1 from Aa2 last Friday. WoW (Week on Week), the Dow Jones Index up 0.7%, its 3rd straight gains. The Dow declined as much as 48 points intraday after Moody’s downgraded Ireland’s government-bond rating by five notches and said the country had a weak economic outlook. Moody’s also put the credit rating of Greece on review for a possible downgrade. However, the Dow Jones narrowed the loss to 7 points and end at 11492 points as President Obama signed a tax-cut plan into law and November’s leading economic indicators made its biggest jump in eight months, signaling the recovery should pick up steam early next year. On Wall Street, strengthening economic data and a bottoming VIX of 16.1 (year low: 15.2) could signal that a lot of bad news has been discounted. Nevertheless, as slow Stochastics are extremely overbought and MACD is heading towards the overbought zone, the Dow is likely to consolidate its recent gains (+4.4% in Dec and +10.2% YTD) in this holiday shortened week (closed on Friday due to Christmas). Immediate resistance level is 11612 (upper Bollinger band)whilst support levels are 11299 (middle Bollinger band) and 11217 (50-d SMA). 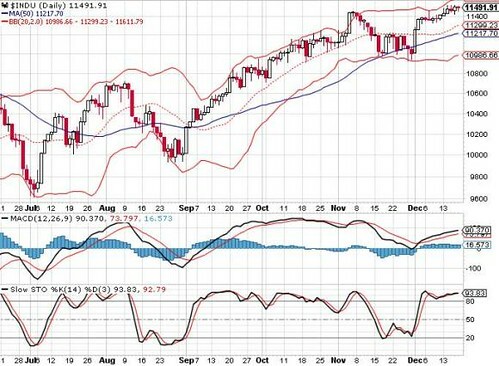 Daily Dow Shows Upside Bias With Strong Resistance At The Upper Bollinger Band At 11612 level.